PPM has the expertise to construct and maintain steel, timber, concrete, and composite marine structures. 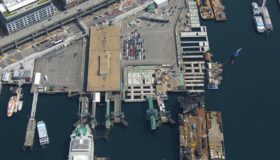 Our team has constructed and maintained high-capacity military piers, container facilities, timber docks, open-cell® and traditional bulkheads including combi-pile walls, floating harbors, and high-capacity travel lift piers. 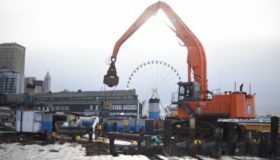 These structures have included drilled and driven piles, rock anchors, cast-in-place concrete, pre-cast concrete panels, post-tensioning, structural steel erection, timber, fendering systems, crane rails, and all associated utilities. Our projects have included new construction and renovation of existing facilities including thermal spray metalizing for corrosion protection and under-dock repairs to stabilize structures. Much of our work has taken place around active container operations, port facilities, ammunition handling, and cruise ship traffic throughout the PNW, AK, and Canada. Our mid range 100- to 600-ton capacity crane barges coupled with our highly skilled workforce and extensive regional expertise provide us exceptional advantages. We have performed these services internationally and on fast-paced construction projects with logistical challenges, operating facilities, and experienced management.